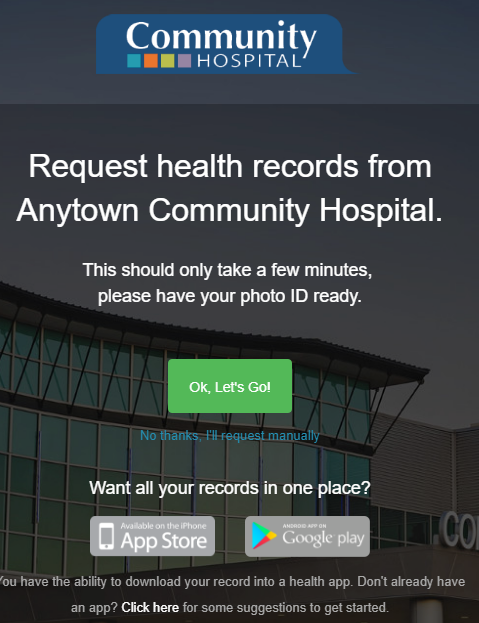 Several provider organizations develop Health Record Request Wizard, an online tool that walks patients through submitting a request to providers for electronic copies of their medical records. It extends a previous form developed by AHIMA by adding branching logic. Despite the headline proclaiming that it helps families obtain and share their records, it doesn’t – it addresses the 2 percent of the work involved in providing a standard user interface for such requests while neatly turfing off the 98 percent of technical integration to EHR vendors who may not see the value in supporting someone else’s front end. Only three health systems and no EHR vendors have pledged to support it. Plus it doesn’t support the most prevalent and essential healthcare technology – the fax machine. From HIT Medical Student: “Re: JAMA article. I think your readers will find the author’s conclusion as ridiculous and insulting as his title. How are physicians still using ‘autism’ as a pejorative in professional settings? 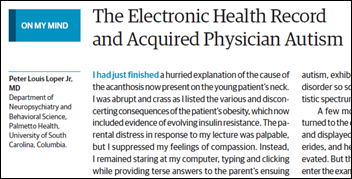 At what point, if ever, are all physicians going to understand that EMR documentation is a vital part of patient care and population health management?” The JAMA Pediatrics opinion piece titled “The Electronic Health Record and Acquired Physician Autism” was written by Palmetto Health (SC) psychiatrist Peter Loper, Jr., MD. He blames a “fixation on the EHR” for his being “abrupt and crass” with patients, complaining that he had previously refused to use an EHR during encounters and admitting that he was “chronically behind on documentation.” His point is that focus on the EHR during encounters causes doctors to “exhibit the same behaviors that render this disorder so socially incapacitating for those on the autistic spectrum” while failing to note the humanity of the encounter and that the physician-patient relationship is key to disease management. He could have made his point without the autism reference, and had he done that, I would defend him since he’s a child-focused psychiatrist and EHRs (Palmetto uses Cerner) do little to improve his practice over paper other than to get him paid. He also suffers from the ubiquitous misperception that his N-of-one experience is generalizable to the entire medical profession and also fails to consider how his employer chose to configure the EHR and mandate its use, doing as doctors often do in shooting the EHR vendor messenger without realizing that it wasn’t them who made the workflow decisions. From Crass is Greener: “Re: Memorial Sloan Kettering and Paige.AI. Your update makes me wonder about its business relationships with IBM and Allscripts looks like, knowing that IBM needs to prove out Watson and Allscripts’ propensity for ‘doing deals’ (see Verity Health).” Hospitals excel at cloaking business deals behind lofty, altruistic proclamations (this is especially common with oncology and pediatrics since everybody is extra empathetic to those patients.) It would be interesting to see MSKCC’s contract with IBM, especially since reports suggest that Watson Oncology is more of a mechanical turk that just sends whatever recommendations MSKCC’s doctors manually offer while disguising it to look like machine-powered insight. I wouldn’t trust any deal involving Patrick Soon-Shiong’s Nant companies, and the apparent enthusiasm with which Allscripts did so suggests desperation on both ends of the transaction, leaving the now-bankrupt Verity in the middle of a Sunrise implementation they didn’t want and their financial Santa Claus moving on to other shiny objects after just one year. My life’s most relevant lesson learned is that people and organizations (including many non-profits and all health systems) do whatever benefits them the most, so follow the money. Listening: new from Badflower, LA kids who can crank out some hard rock. They are touring tiny venues (like bars) right now – they’ll be in Madison, WI on October 12. I’m enjoying their music along with the best manufactured cookie I’ve had in years, Oreo Thins with pistachio (I expect the coconut to be equally wondrous). Akron Children’s Hospital (OH) promotes pediatric hematologist-oncologist Sarah Rush, MD to CMIO. Intelerad Medical System hires Paul Lepage (Telus Health) as president/CEO. 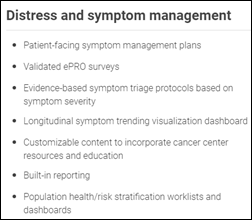 Cancer management and patient engagement technology vendor Carevive goes live with its patient care planning software at University of Missouri Health Care’s Ellis Fischel Cancer Center, where it is integrated with Cerner Oncology. In urge-to-merge and marketing provider news, Greenville Health System and Palmetto Health will rename their South Carolina partnership to Prisma Health, while in Florida, Orlando Health and Lakeland Regional will end their affiliation October 1 after just one year due to their “different strategies and distinctive communities served” that were apparently not evident 12 months ago. One might assume it was an uneasy relationship between Orlando and Lakeland since the websites of both systems have been scrubbed of any evidence of the affiliation, including their rosy press releases from last year that predicted improved patient access and clinical quality. And in Maine, Eastern Maine Healthcare Systems (which oddly makes “system” plural) will rename itself Northern Light Health, following the lead of hospitals that have eschewed their confusing “health system” moniker to make a land grab for the “health” label even though hospitals have only a tiny impact on health while taking the lion’s share of healthcare expenditures. Intermountain precision genomics director Lincoln Nadauld, MD, PhD decries EHR-generated PDFs as a crude form of interoperability, noting that a particular patient’s 143-page record could not be searched, viewing it caused it to re-default to 6-point font with each page flip, it could not display CT scan images, and it contained only the first page of genomic testing results. He advocates a patient-controlled, cloud-based, searchable repository, not surprisingly since he wrote the piece for Ciitizen, a pre-beta vendor that will offer such a sharing platform. It sounds a bit like CareSync, which unfortunately couldn’t make a go of offering a stellar service that also included having humans obtain the subscriber’s medical records (my CareSync experience was excellent). 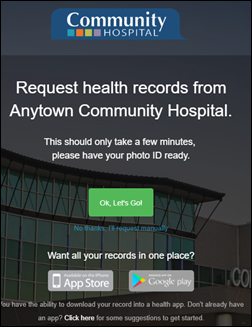 I’m ever-skeptical about a business model that expects patients to obtain and upload their own records since they historically won’t bother. An Associated Press analysis finds that despite the White House’s claim in May that drug companies would announce “massive” price cuts almost immediately, 2018 has seen 96 price increases for every one price reduction. 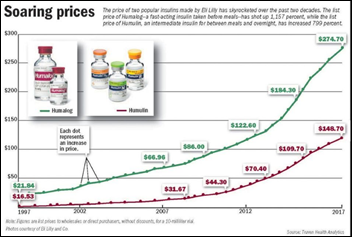 HHS Secretary Alex Azar — a former executive of a drug company that dramatically increased insulin prices during his tenure — says he’s not counting on “the altruism of pharma companies lowing their prices.” Drug price hikes are often small but frequent and makers of competing products often raise prices in lockstep. Former UN Secretary General Ban Ki-moon says the US healthcare system, the world’s most expensive by far, is morally wrong in that “nobody would understand why almost 30 million people are not covered by insurance.” He says drug companies, hospitals, and doctors are using their lobbying power to avoid universal healthcare. A Michigan jury awards $130 million to the family of a boy who in 2006, as a two-month-old, developed cerebral palsy that the family’s attorneys claim was due to a botched IV start at Beaumont Hospital. The family’s lawyers say the now-12-year-old is a “charming and beautiful boy” who needs help getting in and out of the bathtub. 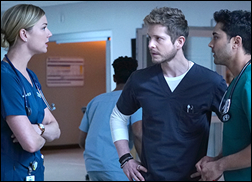 I’ve lost interest in the heavy-handed and unrealistic medical program “The Resident,” but its Season 2 premiere this week borrowed an idea from year-old episode of “Grey’s Anatomy” by featuring a cyberhacking story line. The hospital’s drama-filled blackout turns out to be the work of a hacker who got herself admitted to the hospital so she could breach its systems from the inside (Hollywood loves “the call is coming from inside the house” as a shocker) in revenge for high medical bills that forced her to drop out of college. Least believable (and that’s saying a lot for this episode) is that the hacker was admitted for a UTI instead of being streeted with a prescription for antibiotics, and when confronted about the breach, she handed over a thumb drive backup that somehow fixed everything. Not unbelievable is that the hospital fired an uninvolved IT guy over the incident. Crossings Healthcare Solutions will demonstrate its clinical decision support tools for physicians, nurses, and informaticists at the 11th Annual DV/NJHIMSS Fall Event this week in Atlantic City, NJ and at the Cerner Health Conference October 8-11 in Kansas City, MO. Kyruus will convene a CEO panel at the Fifth Annual Thought Leadership on Access Symposium in Boston October 15-17. MModal and Enjoin will partner to offer a technology-driven clinical documentation improvement advisory solution to address population health. The Wisconsin State-Journal profiles Nordic Data & Analytics Services Delivery Manager Eric Pennington. Nordic’s managed services division has signed 20 clients and expanded to 100 consultants. Healthwise launches its FHIR app in Epic’s App Orchard. Aprima will offer HIPAA compliance programs from Abyde. Mmodal partners with Enjoin to offer clinical documentation consulting services. ZappRx partners with specialty pharmacy Dunn Meadow to speed up prescription access for oncology and pulmonology patients. FDB publishes a new case study describing how Health First improved medication adherence with FDB’s Meducation in its Allscripts Sunrise EHR. AdvancedMD will exhibit at WebPT’s annual Ascend conference September 28-29 in Phoenix, AZ. Aprima, CoverMyMeds, CTG, Culbert Healthcare Solutions, and Direct Consulting Associates will exhibit at MGMA September 30-October 2 in Boston. CarePort Health will exhibit at ACMA Maryland September 29 in Baltimore. Change Healthcare will host Inspire 2018 September 30 in Phoenix, AZ. Cumberland Consulting Group will exhibit at the MDRP Summit 2018 October 1-3 in Chicago. Dimensional Insight will exhibit at 2018 IntegraTe October 2 in Davie, FL. I applaud your comment of “doing as doctors often do in shooting the EHR vendor messenger without realizing that it wasn’t them who made the workflow decisions” because this is the primary reason that most EHRs are not as ‘intuitive’ or ‘usable’ as we would like. I have frequently seen that the decision of one person or group has deleterious effect on others using the system. I’ve also seen situations where the vendor will speak up and tell the decision-makers that this would not be a good workflow and the decision remains unchanged. Re: Intermountain precision genomics director decries EHR-generated PDFs as a crude form of interoperability…. 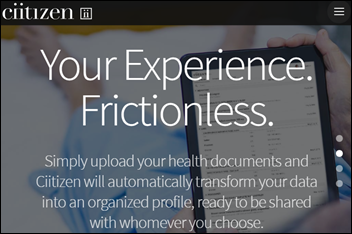 I have to guess that most healthcare provider organizations and related EHR vendors still are not aware that in 2008, PDF became an international, OPEN standard (ISO 32000-1, Document Management – Portable Document Format – PDF 1.7). As such, PDF has been recognized worldwide as the most reliable, flexible, and feature-rich document format for information exchange because it supports and manages any type of file format, including structured data, text, graphics, x-rays, and video that are used in the healthcare industry. However, what saddens me is that for the past 10 years, healthcare provider organizations and related EHR vendors still are not familiar with the attributes of the DYNAMIC format of the PDF document (NOT the static format, with which all users are familiar, including the above user and EHR vendor). This is probably one reason why PDF Healthcare, a 2010 Best Practices Guide (BPG) supplemented by an Implementation Guide (IG) (i.e., PDF-H was never a proposed standard) was never accepted by the healthcare information technology industry. PDF Healthcare described the intersection of the PDF standard and the Internet’s eXtensible Markup Language (XML) standard for moving and sharing data, allowing any standardized data set to be embedded in a PDF and then linked to the actual display of that data, retaining the XML. Consequently, PDF Healthcare stored and exchanged health information prior to or in lieu of deploying complex EHR exchange platform applications. In more simple terms, for example, if a consumer, provider, or provider organization (C/P/PO) needed to send a patient’s (structured) medication list and (unstructured) radiology exam result report to multiple physician offices — some with office EHRs, some without — the sending C/P/PO would be able to embed and securely send those documents in a PDF “container.” If the reports were sent to a P/PO who did not have an office EHR, the receiving P/PO would be able to view the documents and/or print them to paper — even from his/her smartphone without the need of a computer. However, if the reports were sent to a P/PO who had an office EHR, the EHR would be able to consume the XML data in that PDF container and populate office’s the EHR!